Apple makes computers for ordinary people. Some of those people might be rocket scientists or rodeo bull riders, but Macs are designed for grandmothers and soccer dads, too, and require neither exceptional scientific learning nor reckless courage. Yet when things go wrong, or even appear to go wrong, many Mac users forget the "keep it simple" philosophy of the Mac and engage in convoluted superstitions, contorted troubleshooting, and risky experimental surgery. November's meeting -- just in time for Thanksgiving -- covers utilities, those essential programs you use for keeping your Mac in top shape and, if things go wrong, return it to working order. Sadly, none of them can roast a turkey. This month’s meeting will start with the traditional Question & Answer session. Advanced questions are encouraged and can be sent to feedback@wap.org. Following the Q & A session, any important club announcements will be presented followed by a short coffee break. The Pi will be hosting the George Mason University Mac User Group at this meeting. Come meet more Mac enthusiasts! Check back here to see any updates or changes to the meeting. The meeting will be held in Science and Technology I, Room 131. 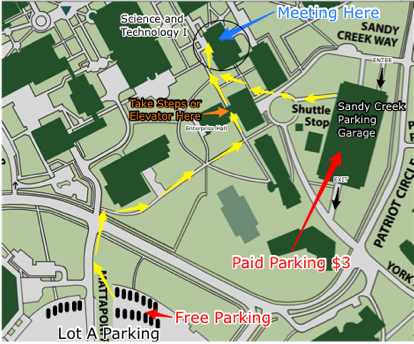 Free parking is available in Lot A, while the parking in Sandy Creek Parking Garage is a pay-for-parking facility. Sandy Creek parking is more convenient and closer, and the Pi will continue to subsidizing that facility's parking fee by providing vouchers for $3.00. Park as close to Mattaponi River Lane as possible, then walk north along that road toward the main campus buildings. The sidewalk route takes you directly to the side of Enterprise Hall (our prior meeting location). Pass through the Enterprise Hall walkthrough. You will have to go up one set of stairs or you can use the elevator just inside the building. Continue beyond Enterprise Hall to the Science and Technology I building, ahead and to the right. Our meeting takes place in Sci & Tech I building at the entrance level, just inside the front door. There will also be signs posted to help guide you to the right location. It is at least a five-minute walk from Lot A and up a slight incline. We will be using a golf cart along the route, to offer rides to those who want or need a lift.